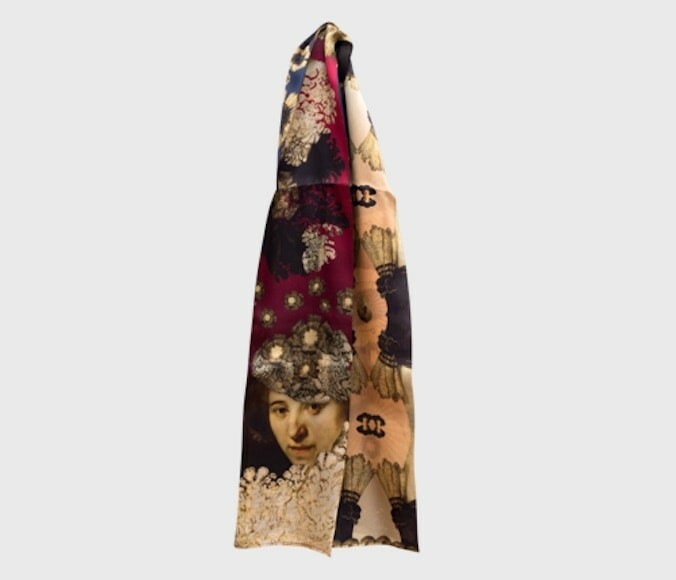 An artistic and beautiful scarf of 100% silk, inspired by the world-famous portraits of Marten and Oopjen, which Rembrandt van Rijn immortalized on canvas in 1634. 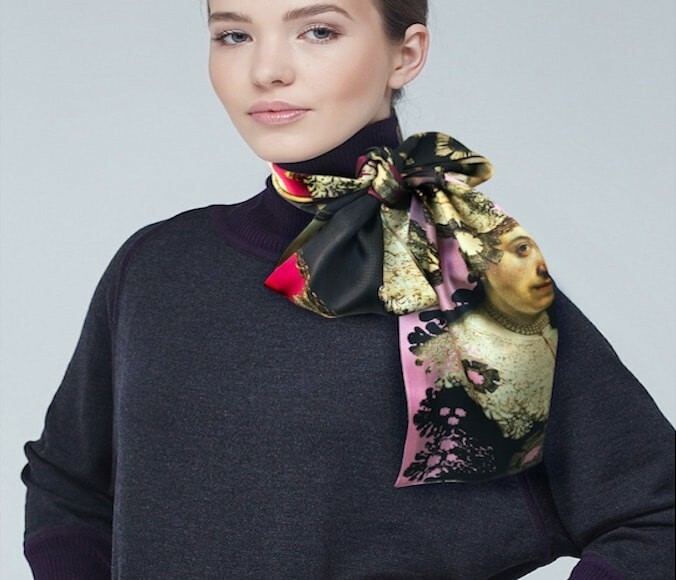 The scarf is enriched with motives and shades of blue and red in which excerpts from the portraits of Marten and Oopjen are tastefully incorporated into the two different sides. 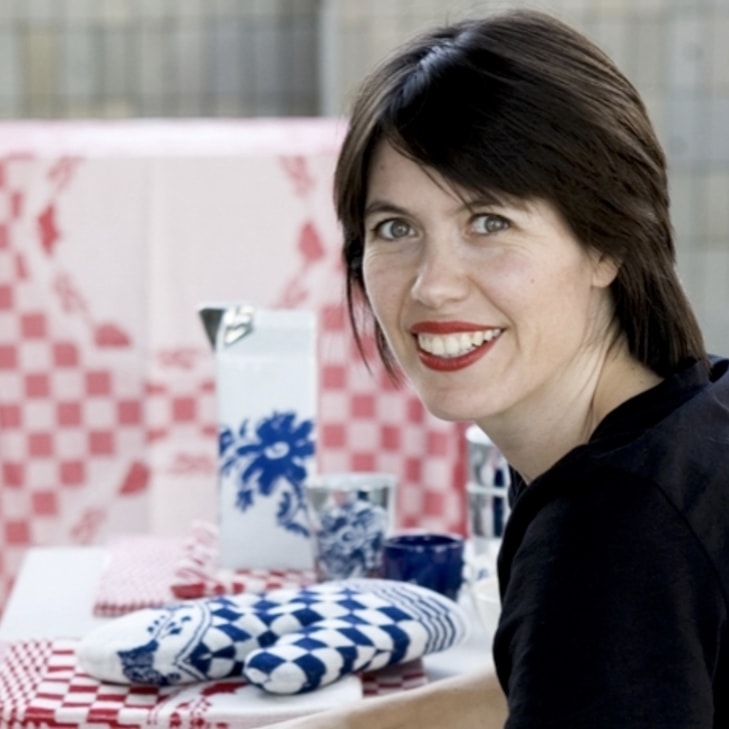 Designed by Wanda van Riet following the Rijksmuseum's High Society exhibition. 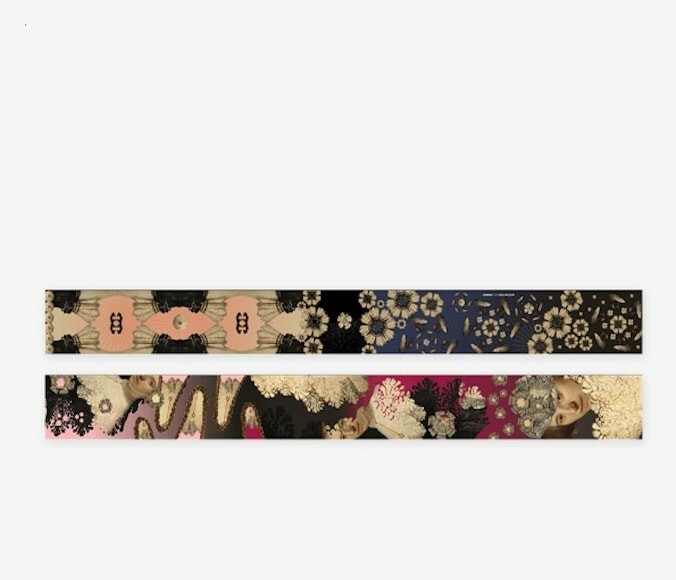 An elegant eye-catcher of 150 x 15 cm. 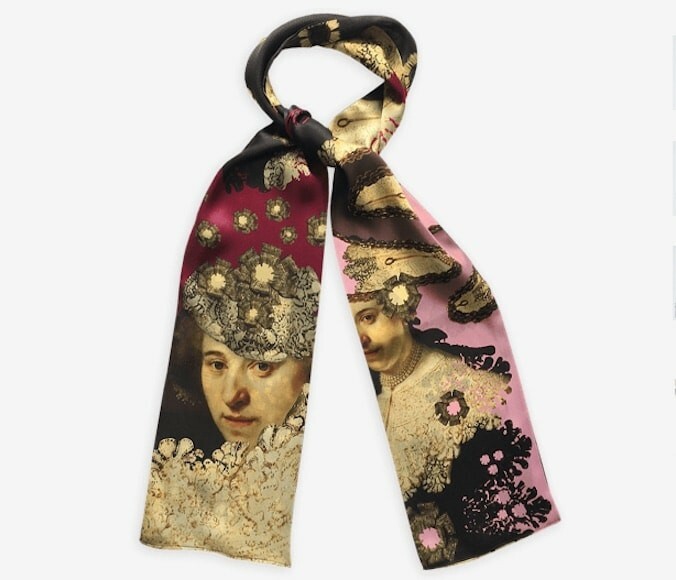 Really special: 100% silk scarf with incorporated in the design processes the beautiful portraits of Marten and Oopjen by Rembrandt from the collection of the Rijksmuseum in Amsterdam. 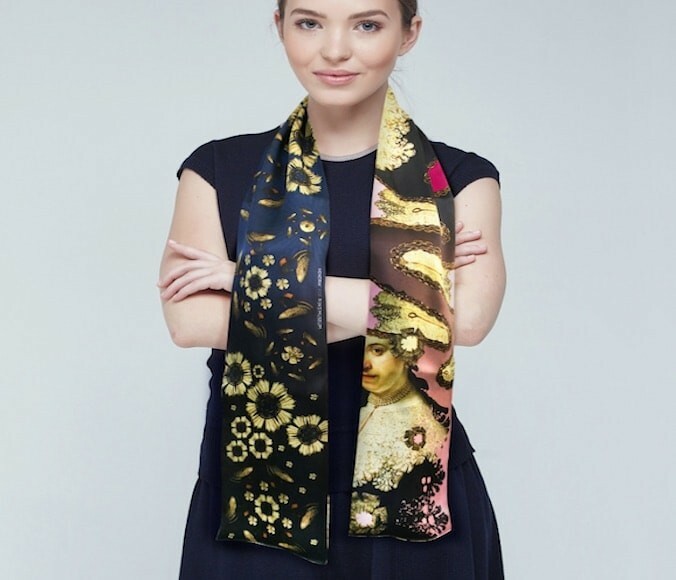 Designer Wanda van Riet has creatively integrated excerpts of these masterpieces in a silk scarf, enriched with motifs and shades of blue and red, which give the scarf a contemporary and chic look. 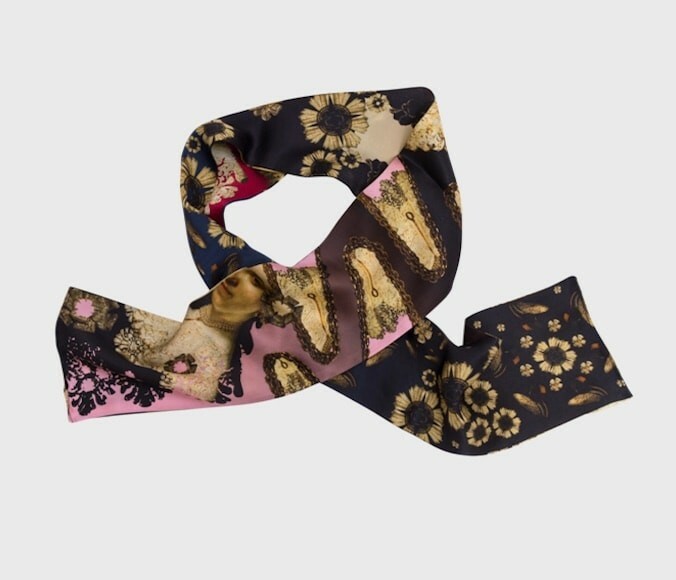 This silk Rijksmuseum High Society scarf has a length of 150 cm and a width of 15 cm. 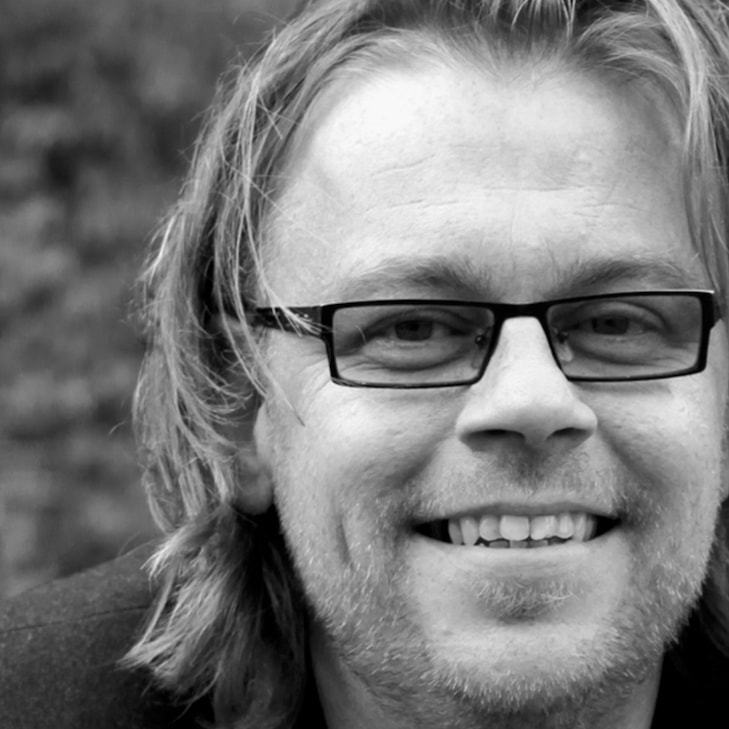 Marten Soolmans posed for Rembrandt van Rijn in 1643, to be forever immortalised. It was commonplace for wealthy people of that time to commission a portrait of themselves. However, a portrait by Rembrandt, the most sought-after painter of that time, was only reserved for the wealthiest. As an acquaintance of Rembrandt and the son of a wealthy Flemish immigrant, that owned a successful sugar factory in Amsterdam, Marten was lucky. Self-assured and dolled up as always, he posed. 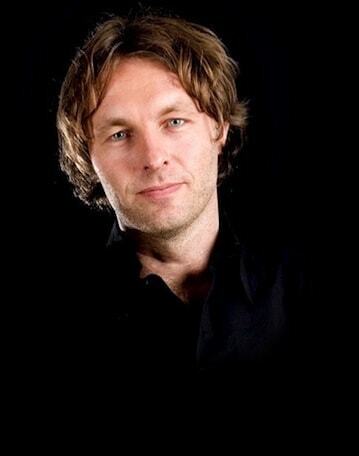 Oopjen already lived in Amsterdam. She came from a wealthy family of traders in grain and gunpowder, and her father wielded a lot of influence in Amsterdam. 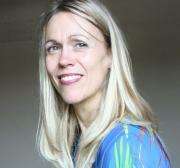 Oopjen wore a less-decorated robe, but her black silk dress and jewellery show the quality and richness of that time. The original portraits of Marten and Oopjen are on display in the Rijksmuseum in Amsterdam. The Rijksmuseum is the most iconic museum in The Netherlands. In 2013 the completely renovated museum opened her doors to the public in the renovated Cathedral of Cuypers at the Museum square in Amsterdam. A breathtaking building with fantastic decor and beautiful exhibits. The Rijks has existed for over 200 years and has been in various locations. In 1885 the museum settled in and officially opened in the Cathedral of Cuypers and became 'The Rijks' as we know it to this day.